“This is the most important historical and political event after the war”, says Nataša Kandić, director of Belgrade's Humanitarian Law Centre after the arrest of Bosnian Serb general Ratko Mladić, 16 years after the International Criminal Tribunal for the former Yugoslavia (ICTY), after Srebrenica, issued a bench warrant for him. Kandić has beena human rights activist for many years and is not very popular in her country, precisely because of her role in denouncing war crimes and her non aligned opinions on Kosovo. 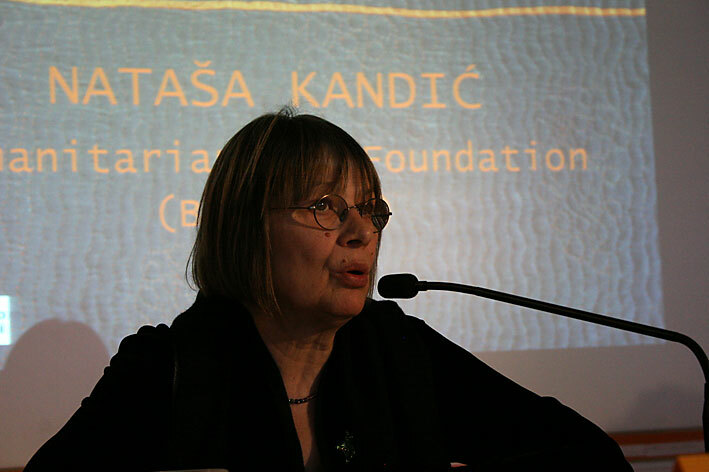 During the Nineties, together with other human rights activists, she was considered one of the “Belgrade witches”. OBC met her after Mladić's arrest. How did you feel when you heard aboutthe arrest? I was very surprised. A few days before, there had been a very negative meeting between Serbian institutions and the ICTY prosecutor Serge Brammertz, who had announced a harsh report on Serbia. I was very pessimistic. And then, on Thursday, everything changed and Serbian President Boris Tadić announced Ratko Mladić's arrest. It is an important event. Victims had been waiting for over 16 years and had stopped hoping it would happen, and yet there he is, arrested. It was a relief. He had always said he would shoot himself, rather than let himself be caught, but it all went down quietly – no bodyguard, no resistance. Do you think we will find out who covered for Mladić? I do not think there will be a public discussion about this, but it will be crucial for the government and the police to understand which groups protected him and where they are now. According to the available information, he was alone with his cousin, which would not imply protection by professional groups. However, it seems unlikely that he found a safe shelter without institutional support. What will change now for Serbia? Mladić's arrest demonstrates Serbia's will to meet international requirements and join the EU. However, I hope the country will take the opportunity to open a debate on the past, because war crime trials cannot really impact society otherwise. I am afraid politicians will say they have done their duty in terms of international justice and wait for the EU's reward. Andnobody will ask the crucial questions – why was Mladić arrested? What crimes is he accused of? How can such resistance be addressed? The problem is that this is happening in the whole region, because the EU lacks a strategy for dealing with the post-war period in the Balkans. Cooperation with the ICTY is the only condition for EU membership, and now that there is only one fugitive left, what is the strategy? Croatia was forced to deal with the past after the Hague sentenced Gotovina. The country was shocked at the sentence. Journalists and politicians rejected it, but what is important is that they had to face the facts. Tadić talked about an important step towards reconciliation in the region. He said another important thing – he is proud of the arrest. He then added that the country is close to completing its cooperation effortswith the ICTY, which is technically true, but cannot simply mean 'closing the door' on the past. Regional reconciliation strongly depends on Serbia's approach. Good steps forward have been made – the resolution on Srebrenica and Mladić's arrest – promoting the debate is the next one. Political authorities need to show serious support fro the establishment of a commission for truth and justice – I am referring to the Rekom initiative. What is the difference between the tribunal and Rekom? Rekom will give voice to victims in a wider context, creating empathy with all of them. Trials are important because they produce facts, but they do not create debate. A debate can be promoted by a committee, like Rekom. It is a crucial step. We have collected around 250,000 signatures for its establishment across the region and, even if we do not reach one million by the end of June, we will keep putting governments under pressureto listen to us. Are people not tired of talking about the past? It is true, most people think about their own lives, because of unemployment, low salaries. They know about the war, they know about the crimes, and they know these arethe main reasons for their poverty. But they do not stop and think about them, because there is no political message in this direction. As a result of the war, there were130,000 victims in the region, but the population is 25 million – it is hard to bring their attention empathy to thevictims, because people are tired of crimes. But I insist – there are no political messages in this direction. How would you relate Karadžić's arrest that took place three years ago to Mladić's? Karadžić was regarded as the creator of Republika Srpska (one of the two Entities forming Bosnia Herzegovina), but he disappointed his followers when he was arrested. He started saying the international community was unfair to him because Holbrooke (the UN mediator during the peace agreements) had promised him freedom if he disappeared from public life. He repeated this for months in order to escape the trial. Mladić, on the other hand, seemed the loyal soldier, the patriot who put Serbs' interests above all else, and this made him somehow more popular than Karadžić. But now, everyone realises that Mladić would have rather lived in the dark and isolated, than end up in a tribunal to defend the Serbian cause, as Milošević did. Mladić's and Karadžić's priority was to escape.